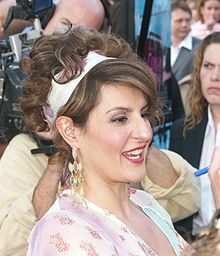 Antonia Eugenia "Nia" Vardalos (born September 24, 1962; Greek: Νία Βαρντάλος) is a Canadian-American actress, screenwriter, and producer of Greek descent. Her most notable work is the 2002 film My Big Fat Greek Wedding, which was based on a one-woman stage play she dramatized and in which she starred. Vardalos was born in Winnipeg, Manitoba on September 24, 1962. She is the daughter of Greek Canadian parents Doreen Christakis, a bookkeeper and homemaker, and Constantine "Gus" Vardalos, a land developer. She attended St. George School and Shaftesbury High School in Winnipeg and Ryerson University in Toronto. She married American actor Ian Gomez on September 5, 1993. Gomez converted to Greek Orthodoxy prior to marrying her. She became a U.S. citizen in 1999. In 2008, they adopted a daughter whom they named Ilaria. She posted an advice column about the adoption process at The Huffington Post. It was announced on July 3, 2018 that Vardalos had filed for divorce from Gomez after 23 years of marriage, due to irreconcilable differences. The divorce was finalized in December 2018. 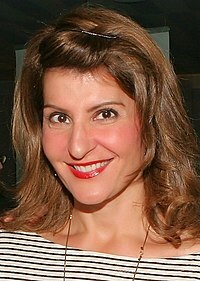 An alumna of the Chicago-based Second City comedy repertory company, Vardalos had many small roles in television shows such as The Drew Carey Show and Two Guys and a Girl; in addition, she provided voices for the 1996 radio adaptation of Star Wars: Return of the Jedi which Brian Daley had written for National Public Radio. She gained fame with her movie about a woman's struggle to find love in My Big Fat Greek Wedding, which was based on a one-woman show which Vardalos had previously written for the theater, basing it on her own personal experiences, and starred in onstage. The film was a huge critical and commercial success. The film earned Vardalos an Academy Award Nomination for Best Writing, a Golden Globe Nomination for Best Actress in a Motion Picture Musical or Comedy and a Screen Actors Guild Award Nomination. The sleeper hit, which quickly became one of the highest-grossing independent films of all time, led to the unsuccessful CBS spin-off series, My Big Fat Greek Life. The show was cancelled after seven episodes and featured the entire cast from the film, aside from John Corbett. Her next film, released in 2004, was Connie and Carla, a musical about two women pretending to be drag queens. Vardalos made her directorial debut in 2009 with the independent feature I Hate Valentine's Day. The film, about a florist finding romance, received only a limited release and grossed $1,985,260 at the international box-office. This was followed by My Life in Ruins, about a misguided tour-guide travelling around Greece and featuring Academy Award winner Richard Dreyfuss. The film was the first American production given permission to film at the Acropolis; Vardalos sought the approval from the Greek government. The film was a moderate success at both the international box-office and DVD sales. In 2011, Vardalos collaborated with Tom Hanks to write the romantic comedy film Larry Crowne for the screen. The film received moderate reviews and was a commercial success, grossing $59.8 million; Vardalos also voiced the character Map Genie in the film. As of 2013, Vardalos was slated to star in the upcoming films Talk of the Town (2012) and A Wilderness of Monkeys (2013). Vardalos joined many celebrities helping to produce The 1 Second Film art project; she herself was featured in The Dialogue, an interview series. In this 90 minute interview with producer Mike DeLuca, Vardalos talked about how her experiences in The Second City comedy troupe helped her as an actress and a screenwriter, and how the unofficial "tell-the-Greek" word-of-mouth program had a hand in catapulting her movie to such great heights. She performed The Beatles song "Golden Slumbers" on the 2006 charity album Unexpected Dreams – Songs from the Stars. Vardalos's struggle to become a mother, which ultimately led her and then husband Ian Gomez to adopt after thirteen distinct in vitro fertilization attempts had failed, made its way into a book she wrote, Instant Mom, which was published in 2014. Vardalos likewise starred in and co-wrote the sleeper hit My Big Fat Greek Wedding 2, which was released in March 2016. It was less successful than the original had been; however, it earned over $60 million from an $18 million budget. Beginning in 2015, Vardalos and Gomez co-presented The Great American Baking Show, formerly known as The Great Holiday Baking Show, for ABC-TV. But with the failure of the Gomez-Vardalos marriage, it was not known, as of the first week of October of 2018, whether they would continue to do so. In 2018, Vardalos guest-starred in an episode of The CW series Crazy Ex-Girlfriend. 1996 High Incident Uncredited Episode: "Father Knows Best"
1996 Common Law Uncredited Episode: "In the Matter of, Acceptance"
1997 The Drew Carey Show Grace Almada Episode: "Strange Bedfellows"
1999 It's Like, You Know... Mindy Episode: "Memories of Me"
1999 Two Guys and a Girl Evelyn Episode: "Career Day"
2000 Curb Your Enthusiasm Larry's Lawyer Episode: "Interior Decorator"
2002 Saturday Night Live Host Episode: "Nia Vardalos/Eve"
2009 Drop Dead Diva Lisa Shane Episode: "What If?" 2011 Cougar Town Angela Torres Episode: "Damaged by Love"
2012 Grey's Anatomy Karen Episode: "Hope for the Hopeless"
2015 Marry Me Pam Episode: "Mom Me"
2015 Jane the Virgin Barbara Stanbrook Episode: "Chapter Nineteen"
2017 Dr. Ken Tiffany Episode: "Ken's Big Audition"
Episode: "The Spear of Selene"
2018 Crazy Ex-Girlfriend Wendy Legrand Episode: "I'm On My Own Path"
^ "Sending up the Greek in spirit". The Age. Melbourne. October 6, 2002. ^ Nia Vardalos profile, filmreference.com; accessed July 2, 2015. ^ Seiler, Andy (August 28, 2002). "'Greek Wedding' marches on, much to Hollywood's surprise". USA Today. Retrieved May 20, 2010. ^ Nia Vardalos profile, Yahoo! Movies; accessed July 2, 2015. ^ Nia Vardalos. "The List". The Huffington Post. Retrieved January 28, 2009. ^ Mike Vulpo (2018-07-03). 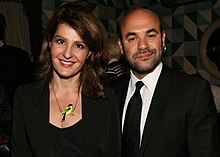 "Nia Vardalos Files for Divorce From Ian Gomez After 23 Years of Marriage". eonline.com. Retrieved 2018-07-03. ^ Fernandez, Alexia (September 7, 2018). "My Big Fat Greek Wedding's Nia Vardalos Settles Divorce 2 Months After Initial Filing". People. Retrieved January 31, 2019. ^ a b c d "Nia Vardalos". Movies. Yahoo! Movies. Retrieved 2012-03-13. ^ "Movies". winnipegfreepress.com. Bob Cox. 2016-03-24. Retrieved 2016-04-18. ^ The Great American Baking Show (ABC); accessed December 9, 2016. ^ Highfill, Samantha (September 2, 2018). "Get the first details on Nia Vardalos' character in Crazy-Ex Girlfriend". Entertainment Weekly. Retrieved September 5, 2018. ^ "Nia Vardalos to Reunite with John Corbett in Another Romantic Comedy". AHN, allheadlinenews.com. August 9, 2008. Archived from the original on 2008-07-04. Retrieved 2008-05-16.